As effective as our office’s preventive services are, some patients require more advanced surgical care. As a skilled periodontist for Acton, MA, Dr. Stephen Grossman provides a range of advanced surgical solutions. Following a carefully designed treatment plan, he and his team help you craft a healthier, more beautiful smile. Once treatment is complete, you can look forward to seeing improved oral health and overall wellbeing. According to some estimates, a majority of U.S. adults struggles with advanced periodontal disease (periodontitis). Sometimes these cases can be solved with scaling and root planing or laser periodontal therapy, but in cases where the patient has developed deep pockets around the teeth and gums, surgical intervention may be necessary. Surgical care for periodontal therapy involves pocket elimination surgery with or without gum or bone grafting. 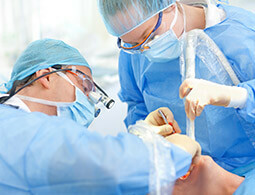 Pocket elimination repairs pockets that are created when patient’s tissue and bone are destroyed by periodontal disease. The larger the pockets grow, the greater the space for bacteria to thrive and destroy tissue. Pocket elimination is a surgical procedure performed using local anesthetic, the same anesthesia your dentist uses when removing tooth decay. Surgical treatment for periodontitis may also involve a gingivectomy or osseous surgery. During a gingivectomy, the pocket wall is removed so tartar and calculus can be eliminated from tooth roots. The accumulation of bacteria plaque, tartar, and calculus is what causes periodontal disease to become advanced. A gingivectomy promotes gingival healing and restoration over time. Osseous surgery may be performed to address defects in the bone around the patient’s teeth. Advanced periodontal disease doesn’t just cause tissue loss. It also causes bone loss. In fact, if enough bone loss occurs, patients may lose one or more teeth. During osseous surgery, Dr. Grossman reshapes the bone to eliminate defects caused by plaque and tartar accumulation. Additionally, we may recommend gum grafting. This procedure reduces further gum recession, protects underlying bone, shields vulnerable roots from decay, and improves overall appearance of a smile. Periodontal disease isn’t the only cause of tissue loss. Others include brushing too hard and hereditary predisposition to tissue loss, but gum disease is one of the most common causes. The new gum tissue Dr. Grossman grafts to the site better supports teeth. Gingival Grafts – A thin piece of tissue is taken from the roof of the mouth, or gently moved over from adjacent areas, to provide a stable band of attached gingiva around the tooth. Connective Tissue Grafts – In this procedure, tissue is taken from the undersurface of the palatal tissue (roof of the mouth) via tiny incisions, and is used to restore missing keratinized gum tissue, and to cover exposed roots of teeth. Donor Connective Tissue Grafts – In some cases, we use donor skin, which eliminates the need to harvest tissue from the patient's palate. Our Acton office are committed to providing exceptional surgical care to patients from Concord, Westford, and beyond. Call us today if you’d like to learn more or schedule an appointment with Dr. Stephen Grossman. With his education and experience, you receive periodontal care you can trust.